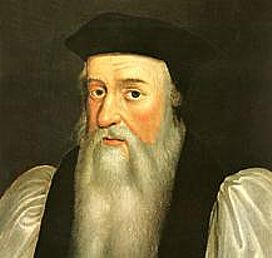 Archbishop Thomas Cranmer, a supporter of King Henry VIII, established the first stage of the reformed English church, but his work brought to an end when he was imprisoned and martyred by the Catholic Queen Mary. Cranmer was a Fellow of Jesus College, Cambridge. Thomas Cranmer is one of the great reforming figures of the English Church, and his legacy still endures. He was born at the beginning of the Tudor period, in 1489. He studied at Cambridge and became a fellow of Jesus College and a Reader (the level below Professor) in Divinity in 1510. However, he was forced to resign his post after he married his first wife, Joan, the daughter of a local tavern-keeper. After her death in childbirth he became a fellow of the college once more and took holy orders in 1523. Henry VIII became aware of him after a plague forced him to leave Cambridge for Waltham, Essex. The King and his councillors realised Cranmer was a willing advocate for Henry’s desired divorce from Catherine of Aragon. Cranmer argued King’s case to Rome in 1530, and two years later became ambassador to the Holy Roman Emperor Charles V.
He was sent to Germany to learn more about the Lutheran movement and met reformers on the continent. Among them was Andreas Osiander, a Lutheran reformer. During his visit he met Osiander’s niece, Margarete, and they were soon married. His marriage meant he had to set aside his priestly vow of celibacy. In 1532, Cranmer was recalled to be Archbishop of Canterbury. However, this was a time when clerical marriage was illegal in England and he was forced to hide his marital state for a while. Once his appointment was approved by the Pope, Cranmer declared Henry’s marriage to Catherine void, and four months later married him to Anne Boleyn. Henry removed the Pope’s authority over the English Church but otherwise there was little reform until after the king’s death. Only then under the reign of the boy king, Edward VI, was Cranmer able to lead a thoroughgoing English Reformation with the freedom to make the doctrinal changes he thought necessary to the church. He was primarily responsible for the first edition of The Book of Common Prayer in 1549 and the revision in 1552. Much of the familiar Prayer Book language is derived from his work – for instance, the Lord’s Prayer and creeds, the canticles at Morning and Evening Prayer, and above all the glorious translation of the Latin collects into prayerful and poetic English. These translations have for over 400 years been at the heart of English spirituality, taught to children and made familiar from regular hearing, Sunday by Sunday, even in their more modern modified form today. Cranmer maintained that a proper Christian Communion depends more on the heart of the practitioner than on the actual bread and wine used in the service. He also encouraged the public reading of the Bible by the entire congregation. Although his views can seem sensible to modern ears, at that time they were nothing short of revolutionary and provoked a storm of controversy. After Edward VI’s death, Cranmer supported Lady Jane Grey as successor. Her nine-day reign was followed by Queen Mary, and Cranmer’s brief reform movement was overturned. Mary was a firm Catholic, loyal to the Pope, who blamed him for her mother’s divorce. She deposed most of her Bishops, including Cranmer, Nicholas Ridley, Bishop of London, and Hugh Latimer, Bishop of Worcester. After a long trial and imprisonment, Cranmer was forced to sign an official document renouncing his reformist views, proclaiming publicly the supreme authority of the Pope and the physical presence of Christ in the bread and wine of Communion. Despite his recantation he was convicted of heresy and sentenced to be burned at the stake in Oxford together with Ridley and Latimer. Cranmer was martyred six months after the other two. As the flames began to rise, he dramatically stuck his right hand into the fire – the hand with which he had signed the renouncement of his beliefs. He then cried out, “This hand hath offended!” and with that gesture, the government’s hope of quelling the Reform Protestant movement was undone. The great Martyrs’ Memorial in Oxford stands in Broad Street close to the spot where the three bishops died for their faith. The Church remembers Cranmer on 21 March 1556, the date of his death.